Water is the most abundant nutrient on Earth. The world has about 333 million cubic miles of water, and the human body is made up of about 60% water. According to data from the National Health and Nutrition Examination Surveys, the average American consumes about 3.18 liters or 13.4 cups of water a day. While that sounds like a lot, here’s the kicker: 48% of that water comes from beverages other than plain drinking water, such as sugary sodas or juices, and 18% comes from food, so the amount of drinking water that Americans are actually consuming is much lower. A study conducted by the Harvard T.H. Chan School of Public Health found that more than half of all children and adolescents in the United States are not getting enough hydration, suggesting that they aren’t drinking enough water. While anyone can become dehydrated, young children are at a higher risk, along with older adults and people with chronic illnesses. Not consuming enough water can put you at risk for dehydration, causing symptoms such as dry mouth, fatigue, thirst, decreased urine output, dry skin, headache, constipation and dizziness. Severe dehydration is considered a medical emergency, as it can lead to fever, rapid heart rate, rapid breathing, little or no urination, low blood pressure and delirium. What’s the Deal With Water? So is drinking “enough” water throughout the day really that important? Well, water does more than just quench your thirst. The body uses water in all of its cells, organs and tissues to help regulate body temperature and maintain other bodily functions. Have you ever experienced a dry mouth, dry skin or dry eyes? Keeping your body hydrated by drinking water helps retain optimum levels of moisture in these areas, as well as in the blood, bones and brain. Water also helps protect the spinal cord, acting as a lubricant and cushioning for your joints. 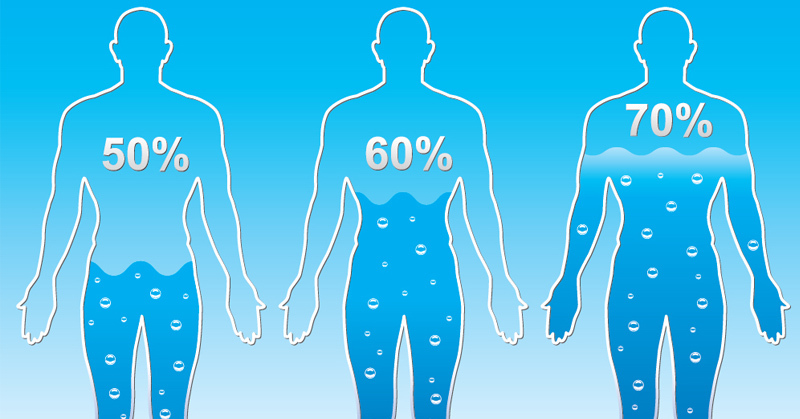 The body loses water in a number of ways, including breathing, sweating, digestion, or through an illness that causes a fever, vomiting or diarrhea. Adequate water intake allows the body to excrete waste through perspiration, urination and defecation, to eliminate toxins. The kidneys and liver use water to help flush out waste, to keep things moving properly. The benefits of water are clear. Your body absolutely needs it in order to maintain your health. But exactly how much does your body need? The easiest way to calculate how much water you should be drinking each day is to factor in your weight and your level of physical activity. Generally, you should strive for between 25-50% of your body weight in ounces of water each day. For example, if you weigh 160 pounds, you should be drinking 40-80 oz of water each day. If you’re physically active, you should aim for the higher end of the spectrum — in this case, 80 ounces. The body loses water through sweating, so drinking plenty of water after exercising is important in order to re-hydrate.